For amateur astronomers seeking superior equatorial control and the ease of a precision computerized GOTO system, the NEQ6 PRO SynScanTM is your answer. 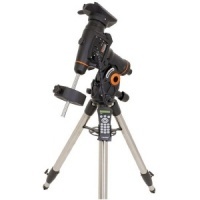 The Sky-Watcher NEQ6 PRO SynScanTM is designed with the novice user in mind. With the user-friendly pushbutton hand control, locating and viewing the treasures of the night sky becomes as easy as a walk in the park. 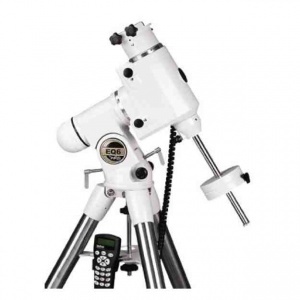 The hand control allows you to point the telescope at a specific object or even tour the skies at the touch of a button. The user-friendly menu system allows automatic slewing to over 42,000 + objects. Even an inexperienced astronomer can master its variety of features in a few observing sessions. "Best for heavy scopes".... "We practically had to thump it to induce any vibrations"
Capable of carrying Celestron’s higher-end SCT optical tubes (up to 11").